Here’s what happens when BabyBlue has a pen and paper and has spent five hours listening to testimony from historian experts. 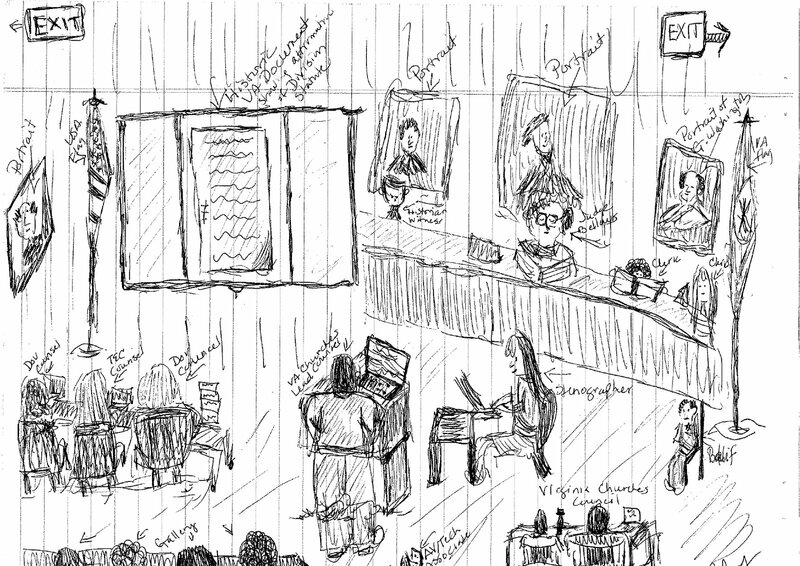 We are artistically-challenged, but as you can imagine we must be cautious with commentary (we love our lawyers). You can click on the picture to make it a bit larger (at your own peril). This was the big moment today – and it was a doozy (for history wonks, that is). Figured that since we shouldn’t really comment on it, we’d draw the moment instead. Nothing like historian professors prowling through libraries looking for cool stuff. Did see friends, some who had driven a long way to be here. Ran into another long-time Truro member who was actually serving on a jury down the hall and that was a great surprise. Bishop David Jones, the Suffragan Bishop of Virginia, was in the court room all day. Witnesses testifying (but have not yet have testified) are not permitted in the court room until after they have testified. So, here’s our report. Can you find the former Truro Parish vestry member from the 18th century in the picture? Thank you for your prayers! Tomorrow should be interesting. Stay tuned. Tip of the tinfoil to Linda for the scan! Thank you! So I guess you can’t tell us about what was discussed because then you’d have to kill us? Jackie: Multi-Circuit Property Litigation, Case No. CL-2007-0248724. Jackie, If you want to see documents in the case look at: http://www.anglicandistrictofvirginia.org and click on the link that will take you to the legal resources page of the website. Most of the pleadings that have been filed are there. Your 1st grade art teacher is proud. You have spacial going on. You should have sufficient time to refine. You can do it.Really, this drawing gives more perspecive than the photos.Who better than a parish member to report this? Probably your self- effacing tack is not neccssary, but keep doing what you’re doing; however it works for you BB.Wrong is wrong and we must now give over to the secular courts since “christians now sue Christians”And, Thanks so much. GW was a parishioner of Christ Church, Old Town Alexandria, so he more a watchman of the break up of what he started than an icon for one side or another. bb, The man next to George Washington at the Courtroom watching the proceedings is Lord Fairfax. Just to set the record straight George Washington and Lord Fairfax along with George Mason were members of Historic Pohick Church before they moved to other churches. In fact I believe Turo Church and Falls Church were both missionary efforts of Pohick Church.